The Oklahoma Department of Transportation is beefing up its online travel tools with the addition of real-time snow plow camera views; the result of a two-year research partnership with Tulsa Intelligent Transportation System Integration Lab at the University of Oklahoma and a nearly $300,000 initial investment. The agency said in a statement that the images from the snow plow cameras will remain posted for up to an hour, allowing motorists to see a snapshot of highway conditions for themselves. When accessing the app’s online map, the Oklahoma DOT said motorists can click on any camera icon to pull up the most recent highway image where available. The agency expects this system will be fully implemented statewide by 2020 at an estimated additional cost of $220,000. It will also provide useful weather condition data to Oklahoma DOT maintenance superintendents so they can better manage their snow-fighting fleet and material usage. 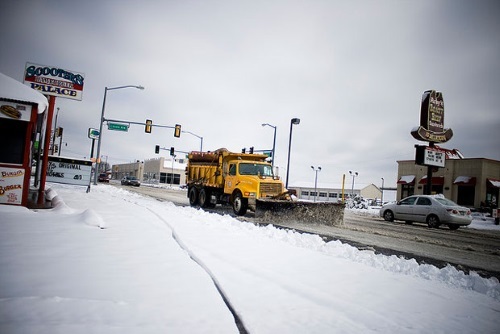 The snow plow camera application was developed in partnership with the Tulsa Intelligent Transportation System Integration Lab at the University of Oklahoma. Terri Angier, an Oklahoma DOT spokeswoman, added in a statement that all of the agency’s online travel tools are now available within one app via the Apple App Store. Angier added that Oklahoma DOT created the app in partnership with the Norman Center for Intelligent Transportation Systems at the University of Oklahoma’s Gallogly College of Engineering as part of an ongoing contract. She noted that the new real-time snow plow views come from new cameras and sensors installed on nearly 200 agency snow plows mostly in rural areas of the state. However, Angier pointed out that similar camera/sensor packages won’t be installed on snow plows operating in the Oklahoma City or Tulsa metro area as motorists already have access to more than 400 camera views of metro-area interstates through www.oktraffic.org. Additionally, the urban areas are maintained by outside contractors and camera/sensor packages are state owned.